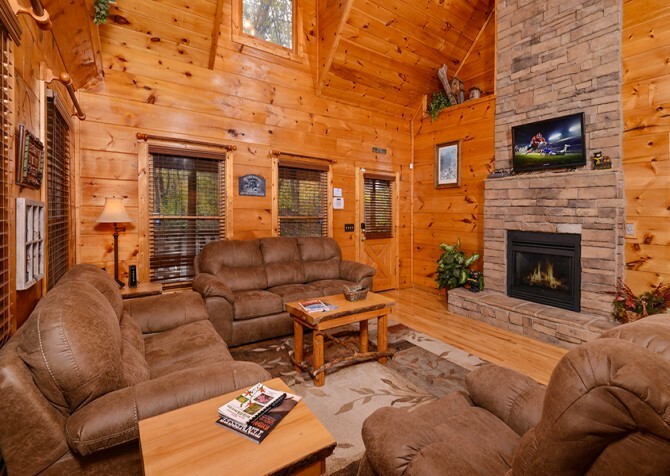 Find your haven away from it all in this completely secluded, 2-bedroom, 2-bathroom cabin in the Smokies. 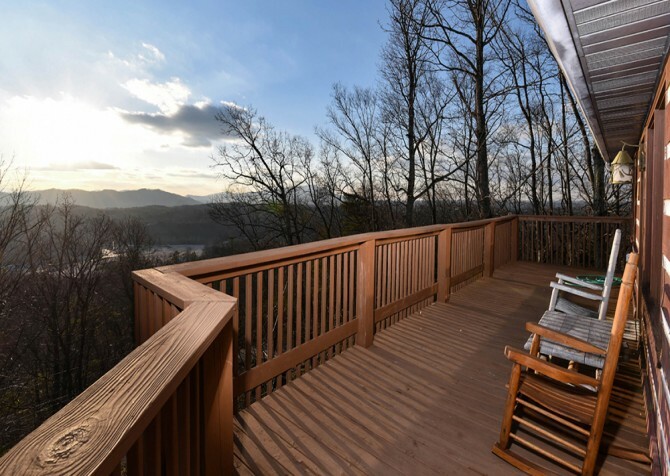 Immerse yourself in nature as you behold the wooded views all around, have a soak in the outdoor hot tub, and savor your French roast coffee in a rocking chair on the covered deck. 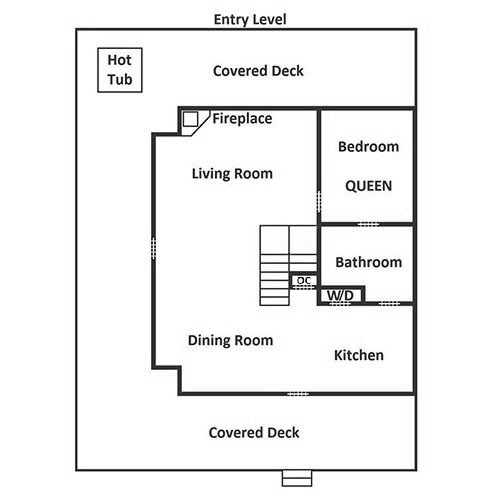 From having a blast in the rec room and watching your favorite movie on the big screen TV to cuddling up by a warm fire and relaxing in the open-air hot tub, your stay in Peanut’s Paradise will be a memorable one. 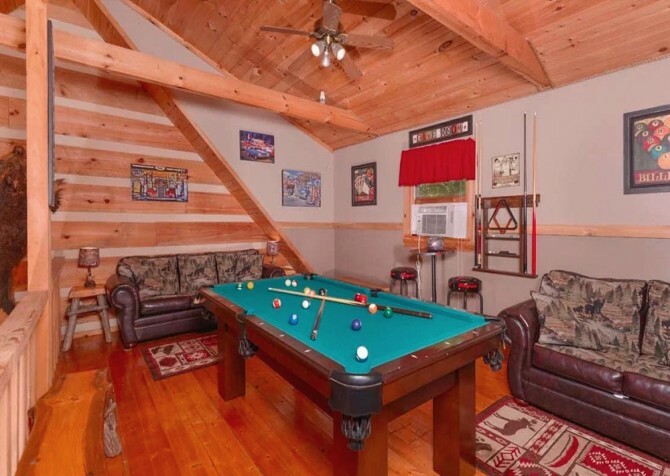 Families can play, friends can relax, and couples can reconnect in this lovely Pigeon Forge cabin away from it all. Just a few miles away, downtown Pigeon Forge means full days of fun. Local wineries and distilleries, all-around fun at The Island, roller coasters at Dollywood, dinner shows on the Parkway, food for every taste…there is no end to what you can do in the Great Smoky Mountains – just minutes from Peanut’s Paradise! As you pass a queen sleeper sofa — and lovely wooded views — you’ll find your way to the cozy living room with even more splendid wooded views and another queen sleeper sofa! With 2 recliners — a.k.a. your hubby’s new nap zone — a big screen TV, a DVD player, and an electric fireplace, this living room is a great place to hang out, chill out, and conk out. Pop in an action movie for a night of excitement, pair a warm fire with homemade cocoa and friendly chats, or just take a load off and admire the surrounding nature through the large windows. Step into the quaint kitchen, featuring a refrigerator, a stove, an over-the-range microwave, a double sink (made of white porcelain), a dishwasher, a toaster, a coffeemaker, and a Keurig! Supporting the cabin’s woodsy theme is a pinecone chandelier overtop a breakfast bar area with seating for 4, where you can easily serve meals to the kids — and keep an eye on them at the same time. In addition to all the appliances, this kitchen is fully equipped with dishes, silverware, pots and pans, and more, so you won’t have to bring any heavy supplies — this is your vacation after all! Directly off the kitchen is the convenient dining area, ready and waiting to host all your cabin feasts! With a natural wood design, the dining table and 6 matching chairs add a touch of nature to every meal. Additionally, the chandelier overhead as well as neighboring windows create a well-lit place to dine or let loose your creative skills with a drawing or two. Head to bed in the master bedroom, which boasts not only a queen-size bed and a flatscreen TV, but also a jetted tub — and multiple windows showcasing close-up wooded views. Enjoy a romantic comedy as you bathe or turn off the electronics and let the fizzle of your bath bomb soothe your mind. If the bath gets too hot, just flip on the ceiling fan to cool down as you rest on the bed. Also featuring a queen-size bed, a ceiling fan, and a flatscreen TV is another bedroom with an added DVD player, so you can binge-watch your favorite series in the comfort of your room. Plus, there are 3 lamps in this bedroom, creating the perfect atmosphere for a good read. 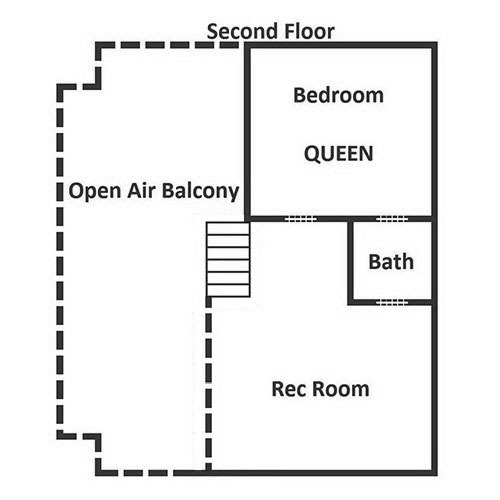 In the loft area, you’ll find a rec room with plenty of games to keep your family occupied for hours on end. From practicing your pool skills and dueling with the multicade (a traditional gaming cabinet) to having a peaceful round of solitaire (bring your most trustworthy deck) and challenging everyone to a chess war, this space will be teeming with cheer, laughter, and victory! Don’t forget to turn on the tube so you can watch the latest sports match while you await your next turn. If games aren’t your thing, relax on one of the 3 stools and watch the birds dance with the trees outside — this way, you’re technically still in the room, showing moral support. Drive up to this cabin on a paved driveway with parking for 2 (parking is steep with a sharp angle). With plenty of seating and 2 eating tables on the covered deck (wraps around half the cabin), you’ll be able to enjoy the wooded views from multiple angles. Rock away your troubles in a rocking chair, enjoy a cup of coffee with a sweet treat outside, grill up some barbecue on the charcoal (picnic style) grill, take an evening soak in the outdoor hot tub, and listen out for a passing night owl! With Wi-Fi provided, you can keep up with your friends on social media, watch the latest Hulu original, and let Google find the best local restaurants. As another perk, you can get your laundry done easily with the cabin’s own washer and dryer. 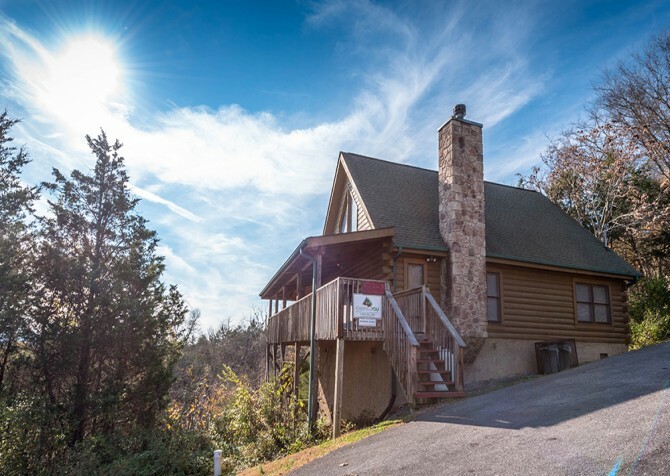 Being so close to hip and happening Pigeon Forge, this cabin is a convenient place to hang out with nature in the morning and venture into the city during the day for fun-filled times. Take a bite out of a fluffy mound of buttery, delicious pancakes topped with traditional maple syrup at Flapjack’s Pancake Cabin! Have you ever wanted to skydive, but you just couldn’t muster up the courage? Well, it’s time to conquer your fear of falling and flying at Flyaway Indoor Skydiving! Check out Pigeon Forge’s famed amusement park: Dollywood. Ride the rollercoasters, eat scrumptious Southern food, see live performances, and more! "Our cabin Peanuts Paradise was beyond perfect for my family. I loved how the arcade game was there to keep my children busy while my husband & I played some pool! The cabin was stocked with everything I thought it wouldn’t be stocked with so no last minute trips to town! The customer service was excellent! We will be back for sure."